After receiving an overwhelming response in 2016 and 2017 from the people of Maharashtra, Paani Foundation today announced the launch of the Satyamev Jayate Water Cup, 2018. Hon. 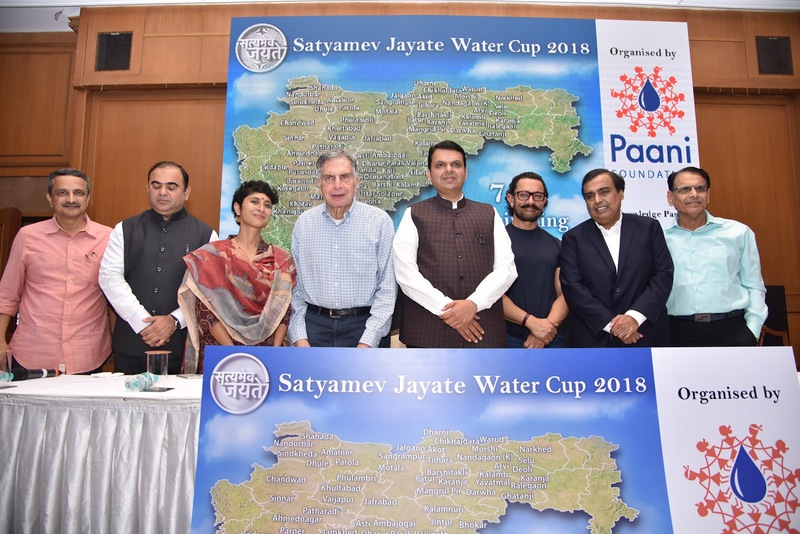 Chief Minister of Maharashtra, Shri Devendra Fadnavis, Aamir Khan & Kiran Rao, Founder, Paani Foundation, & Mr. Satyajit Bhatkal, CEO, Paani Foundation, were present on this occasion. Paani Foundation is an initiative set up by Aamir Khan and Kiran Rao. It has been working since the year 2016 to create a people’s movement for drought-free Maharashtra. This year the competition tenure for Satyamev Jayate Water Cup is from 8th April to 22nd May 2018. The top three villages will get a cash prize of Rs. 75 lakhs, Rs. 50 lakhs and Rs. 40 lakhs respectively. In addition, the top village from each taluka will get a cash prize of Rs. 10 lakhs. The total prize money which the villages stand to win in the competition is nearly Rs. Ten crores. This year the competition has been extended to 75 talukas in 24 districts of Maharashtra. Every village in the selected talukas is eligible to participate and has been given Aamir Khan's signature invitation for this purpose. A grand photo exhibition that explains the journey and purpose of the Water Cup was organized in close conjunction with the government of Maharashtra in all 75 talukas and has been attended by lakhs of villagers and students.